This, ladies and gentlemen, is a photo of my right shoulder. As you can see, it's a bit pinkish. That's because I took my hour-long lunch break yesterday out on the deck behind my office building and I sat on the side of the picnic table that was in the sun. I wore a new shirt for the first time yesterday. As you can probably tell from the state of my shoulder today, the new shirt is sleeveless. My left shoulder is ever so slightly burnt as well, but it's hardly worth mentioning. It doesn't even hurt. How on earth did I get such a lopsided sunburn? (I'm thinking it's something to do with the angle of the sun, but whatever) Not only will I have crazy tan lines on my shoulders, but they'll be lopsided, too. I'll never get them evened out. This is not the first time I've had a lopsided sunburn, though. Once upon a time, in the month of June and the year 2013, I was a blogging globetrotter, living in Tours, France with a host family. My host mother's great-granddaughter was having a birthday party, and I was invited along. The party was at a house somewhere across the river, and it was a house very much like those we see in the United States-- in a neighborhood, not attached to any other houses, with a front and back yard. And the backyard was enormous. Probably bigger than my own backyard. It was a nice, sunny Summer day, and I was wearing a yellow tank top. At one point in the party, several hours in, I found myself seated in a little circle next to a tree along with my host mom and some other family members, just chatting. What I did not realize was that I was only sitting halfway in the shade of the tree. By the time I realized my folly, the damage had already been done. My left shoulder was a bright, raw red, while my other shoulder was untouched. The lopsided pain, flaking, and tan would plague me throughout my remaining time in France and well into my journey in Ireland. As the winter came and I limited my exposure to the sun, my shoulders and all the rest of my skin sank back into the cold, dead paleness that would make a Victorian gentleman swoon. I forgot that the sunburn ever happened... until now. 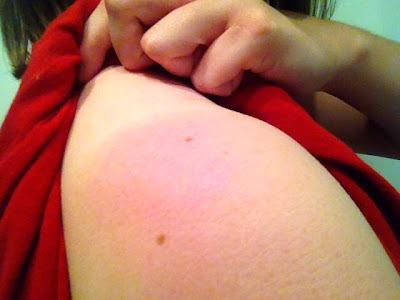 In the summer of 2013, I burned my left shoulder. Now, in the summer of 2014, nearly an entire year later, I have burned my right shoulder. While it might appear that I once again have a lopsided sunburn, I know the truth. I have finally evened out my tan.